Some people find it difficult to talk about mental health and struggle with what to say. Follow our handy tips and you won’t go wrong. Around 1 in 4 of us will experience a mental health illness in their lifetime. We want to increase understanding of the lives of people with mental ill health and make sure people are defined not by their health – but who they are. Despite the progress made in the past decade, we want to step up efforts to combat negative attitudes that still exist in our society. The stigma that surrounds mental health is very much built into the words, phrasing, and language of our time. It’s no coincidence words used to abuse often refer to mental health. Our language can be a barrier to acceptance. 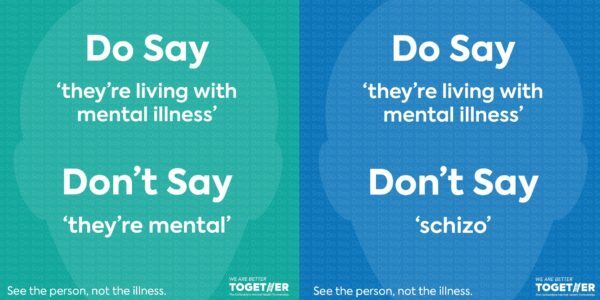 One very important way in which we can reduce stigma towards mental ill-health in our county is by fundamentally changing how we talk about people living with mental illness and the words we use in every day speech. This is not about political correctness. If people become worried about saying or doing the wrong thing, they may avoid talking about the really important issue of mental health. It is about seeing people for who they really are – and not defining anyone by their health condition. That’s why today, on World Mental Health Day, we’re calling for equality and challenging a small number of negative words and phrases. These are some words people with mental ill health find hurtful or harsh because they suggest people are defined by their health condition, are helpless or should be pitied. Quite often the words are simply abusive. This campaign is just part of the wider work of Oxfordshire Mental Health Partnership. We work on all kinds of issues facing people with mental ill-health, as well as delivering life-changing projects and services so people can thrive in their everyday lives, go to work, enjoying time with family and friends, socialise and travel as usual. People living with mental health problems are not defined by their health needs. We’ve got some handy tips to help everyone feel more confident talking mental illness. What is the Oxfordshire Mental Health Partnership? Six mental health organisations from the NHS and the charity sector form the Oxfordshire Mental Health Partnership (OMHP) to make it easier for people with mental health problems to get the best possible support when and where they need it. Who are the six organisations? One mental health NHS provider trust and six different charity organisations all specialising in specific areas of support and recovery. Connection Floating Support: empowering individuals with varying needs and issues with specialist support. Elmore Community Services: providing high quality services for marginalised and disenfranchised people throughout Oxfordshire. Oxford Health NHS Foundation Trust: a community focused organisation that provides physical and mental health and social care. Oxfordshire Mind: providing advice and support to empower anyone experiencing a mental health problem. Response: one of the leading providers of home based mental health care in Oxfordshire and beyond. Restore: supporting people with mental health issues in Oxfordshire to recover and get work. What do these changes mean and how can the partnership help people with a mental health problem? The changes mean that for anyone in Oxfordshire who is experiencing a mental health problem will be able to easily access the local knowledge and expertise that each organisation brings. So, if you are receiving help from one organisation but feel that you would also benefit from support from one of the others in the partnership we can get you the help you need much quicker. This means that we can equip you with everything you need to get better, find stable accommodation or employment and ultimately live a longer and happier life.